In the harbor in Alexandria, Egypt on October 18, 1935 the Italian liner Ausonia had just arrived in the quarantine area and was undergoing inspection when an explosion shook the ship. 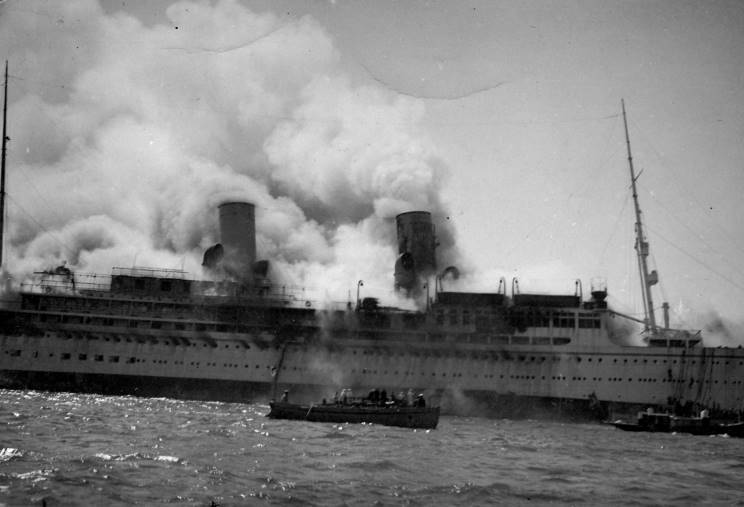 Smoke soon filled the ship and the passengers were moved to the forward section of the ship. 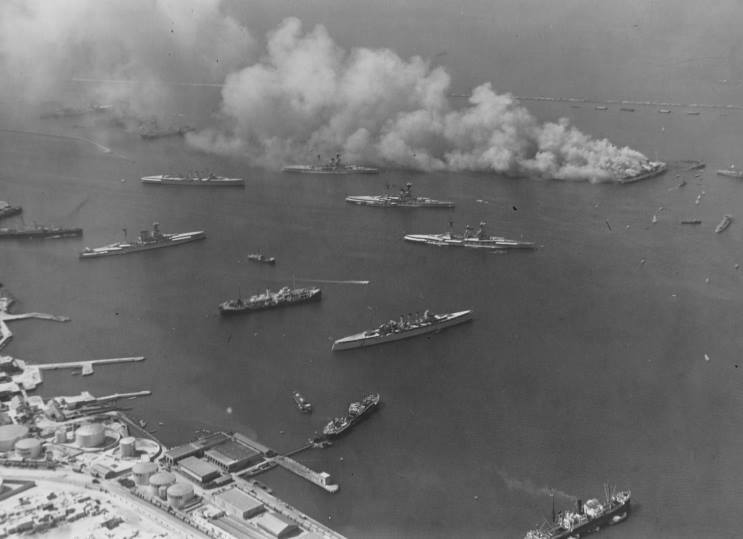 In the harbor a squadron of British warships were anchored, they were under the command of Admiral Sir William Fisher, Commander-in Chief Mediterranean Fleet. Fisher saw the tragedy which was about to occur and he soon took action. Boats from the ships were lowered and taken in all haste to the liner and less than an hour later all the passengers (33 or 35) and all but three of the crew had been removed. In all about 263 people had been saved, but three crewmen perished and three others were missing and presumed killed. Efforts to fight the fires were made by the British sailors and the port authorities and in the afternoon it was thought that the flames had been suppressed, but a second explosion spelled the doom of the ship. Following the episode her master was received aboard HMS Queen Elizabeth by Admiral Fisher who offered his condolences for the loss of his vessel. Some days later the Italian Naval Attaché in London phoned the First Lord of the Admiralty to convey his governments thanks to the Royal Navy for the assistance given to the stricken liner and her crew. 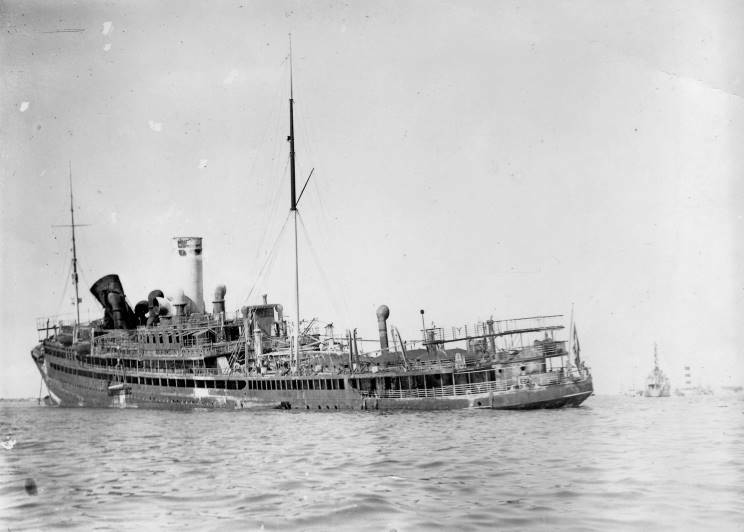 Ausonia was built by Ansaldo in 1928 and was owned by Lloyd Triestino, she was described as "the most luxurious steamer on the Europe-Egypt service," but the luxurious ship burned for many hours and became a total loss, the burned out hulk was towed to Trieste and scrapped. October 18, 1935: Ausonia seen burning in Alexandria harbor. Courtesy of David Butler, R.N. The burned out hulk Ausonia.